How can we cut global inequality? 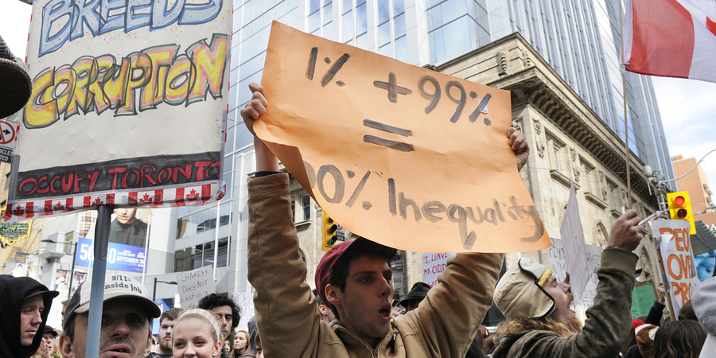 Are you in the global 1%? The website Global Rich List (which bases its estimates on World Bank data from 2008) suggests that earning over €28,000 euros a year is enough to get you admitted to the 1% club in terms of income. That’s not far from the average salary in many European countries. Of course, it’s debatable how rigorous Global Rich Lists’s methodology is. They aim to provoke debate, not to provide definitive data. Different approaches give different thresholds for global 1% membership. For example, according to two academics from King’s College London, if you earn $50,000 (in 2012 prices, which was roughly €40,000 at the time) you would be part of the 1% global elite. Measuring membership of the global 1% by income is likely misleading. A more accurate barometer is probably measuring wealth and assets. Even then, if you own your own house (and have paid off all your debts), you probably at least belong to one of the top 10% wealthiest households. The 2018 Global Wealth Report from Credit Suisse Research Institute defines wealth as “the value of financial assets plus real assets (principally housing) owned by households, minus their debts”. By that metric, anybody with assets of roughly €82,000 is one of the 10% of richest people alive. The point is that many Europeans might be surprised how wealthy they are in global terms. Within their own country, they are obviously unlikely to be in the top 1% of income earners. However, relative to the wages earned by an Indonesian labourer, for example, they are extremely privileged. Likewise, many European pensioners who own their own house will be among the richest 10% of people on the planet (even if in terms of income they are nowhere near that threshold). The way we measure inequality is important. The recent report from Oxfam on global inequality, for example, has gone viral on social media (as it does every year). While the global 1% (actually probably the global 0.1%) have been hobnobbing at the World Economic Forum in Davos, Oxfam reported that 26 people own the same amount, in terms of wealth and assets, as the 3.8 billion people who make up the poorest half of humanity. That statistic is probably not entirely true, though, as inequality is much more complicated. It’s undeniable that global poverty is a serious problem. However, the President of the World Bank, Jim Yong Kim, recently reported that: “Over the last 25 years, more than a billion people have lifted themselves out of extreme poverty, and the global poverty rate is now lower than it has ever been in recorded history”. It’s hard to square that with Oxfam’s statement that the world’s poorest are getting “even poorer”. How can we cut global inequality? Are you in the global 1% in terms of income? Or the global 10% in terms of wealth? Let us know your thoughts and comments in the form below and we’ll take them to policymakers and experts for their reactions! What a far fetched & Utopian question to ask “us” & not “them”! * and therefore cannot cut global inequality! Headlines & statistics ………….and ordinary citizens are left to wonder, maybe getting angry, but can do little to nothing! But- please distinguish between “earnings”, “total net wealth” & “control” ………and try to catch up! After digesting all this info, have a cup of coffee, be glad you were born where you were born, be happy & grateful to be healthy, alive and living where law & order still prevails! Implement socialism so we can all be equally hungry. Why should we seek equality…..I don’t want to be equal, I want to be better. Some people want to be more equal than others. I’d say, we should worry about first things first. Don’t you think? About what exactly?. The most important issues should be 1 the fact that people are still dying on the street and 2 climate change. which are both alleviated by optimizing economic systems. Simply not possible! That’s like saying everyone will never again get cancer or have any allergies. There is no such thing as equality if there was, we would all be inventors and geniuses, we could all be Michelangelo. We are not all the same and that maybe bitter sweet but it’s a simple fact. Punishing those who have studied and worked,their butts off do not owe anyone who prefers to live on benefits, nor those who have large unaffordable families. Whoever feels this,way should live the experience of sharing all they have with anyone who has less for whatever reason. How many times must we watch communism fail? nobody said it was but we don’t all think exactly the same. Some poor people have become millionaires because they tackle the problem differently. Victimhood helps nobody. Equality in schooling gets worse every year as our children are dumbed down and passes get easier. I suggest we nuke the world. That way everybody is equally dead. The ideas are already out there, it’s time to get serious with the actual implementation. Top marginal tax rate of 62% for incomes above 500,000 EUR + additional 5% tax for every additional million earned; wealth tax for assets above 1 million EUR; billionaire’s tax for income and assets; financial transactions tax; progressive corporate tax (minimum EU wide rate to be established): 60% tax for profits above 100 million EUR; special tax for exploitation of oil & gas (like in Norway). Then reducing or eliminating any co-pays and deductibles for health insurance with a compulsory public option. Stop supporting regime-changing interventionist wars that cause havoc & poverty, and bring huge profits to the military industrial complex. Tuition-free (or small co-pays) for everyone to ensure equal access to post-secondary education. Etc. etc. etc.